Why did I choose the GAAR then if I was going to go almost against the whole idea? Ohhh... and I had to change the time to normal day instead of the 0500 start as, for some reason, X-Plane thinks that it's pitch black in Darwin at 0500 in February. I know from personal experience in "the top end" that it is VERY MUCH day light at that time of year. At any rate, after many failed attempts to get this bird of the ground ( I kept crashing after takeoff for some reason) and going through the cold and dark procedure each time during this weekend, tonight (Sunday) I decided I had earned a cheat and lined myself up on Runway 29, had a successful takeoff and got myself turned around and headed to the first checkpoint YPTN Katherine. Hmm that's weird. En route I noticed those flying pieces of geo on the C-17. Unfortunately this plane was made for XP10 and there have been a few changes in XP11 and I don't think the Devs (Virtavia) are supporting their older birds, but I'm going to ask anyway. 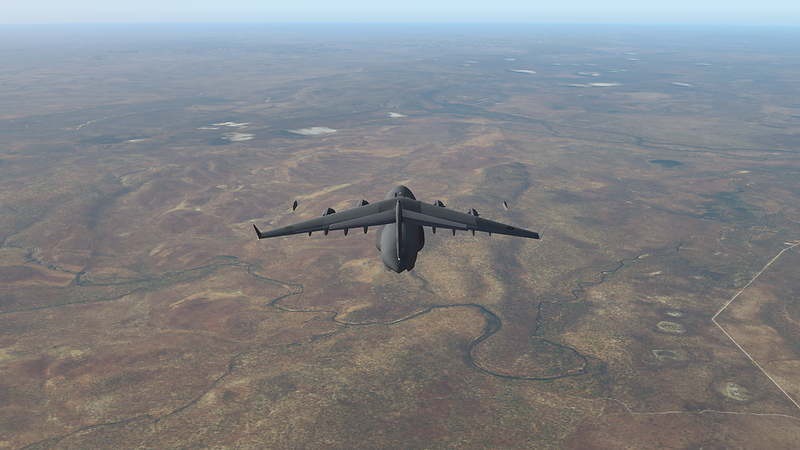 25mins later and we touchdown at YNGU Ngukurr and then use the mighty reverse thrust on the C-17 to backup the runway and park our bird. C-17 pilots will use the reverse thrust in this way after landing if needed to get the bird into position for cargo unloading. 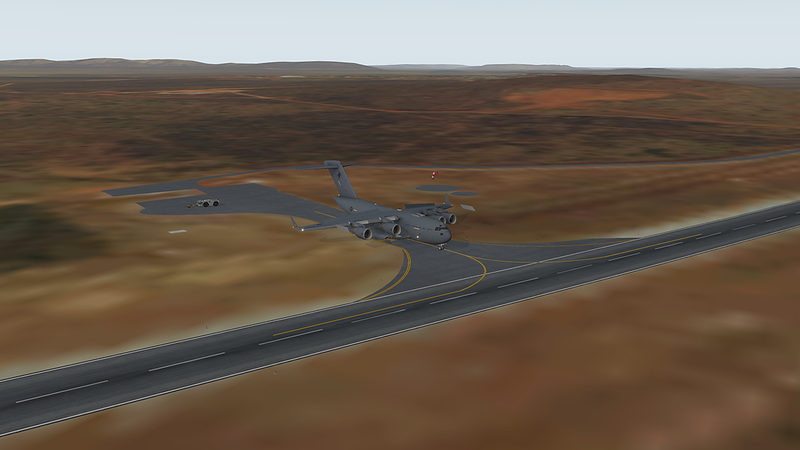 D'Oh, just went to upload an image from Plan-G showing my crazy attempts at, first trying to sight the damn airfield and then trying to slow the Globemaster down. 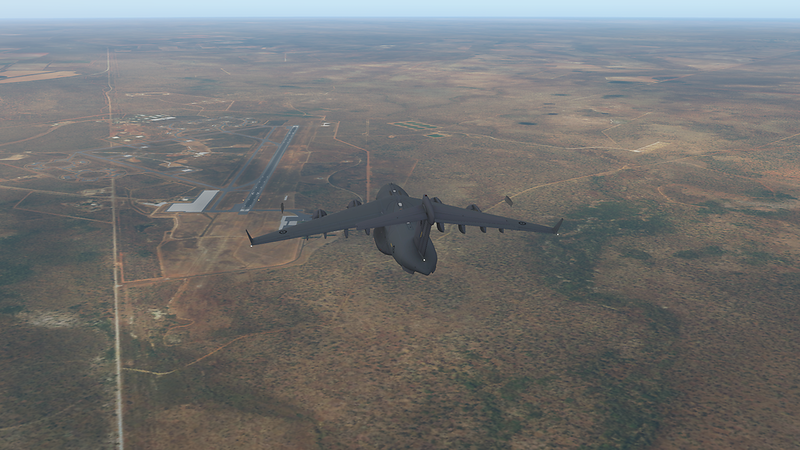 LOL I overshot 3 times before I finally landed and then only just kept myself on the runway. Learning, learning, learning. She's NOTHING like the Let L-410 I flew in the MEBAR, but we have some time to get to know each other. I don't think you have to apologize for ANY modifications of other's FS experiences/plans/routes. It's your sim, your adventure, your choices. 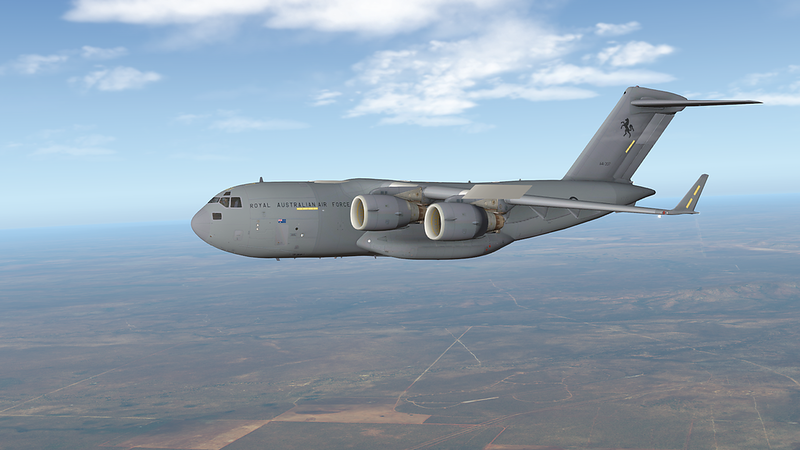 And your choice of Virtavia's C-17 is a good one. I fly that beast sometimes in Airhauler. It feels like a handful...but handles quite nice actually once used to it. 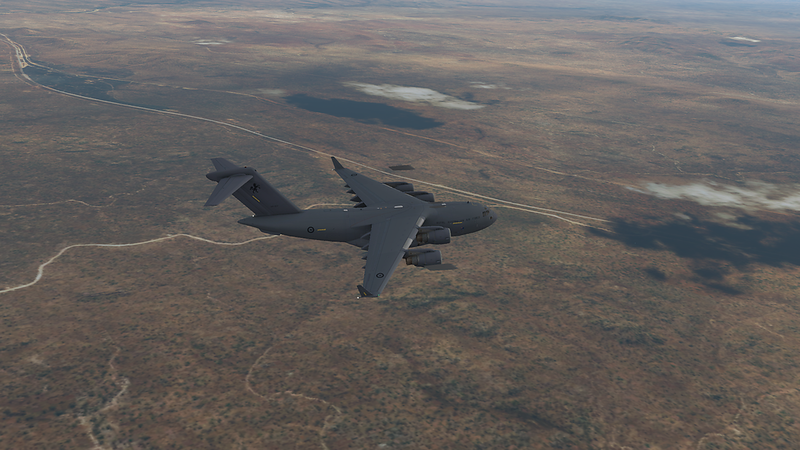 Ai pilots mostly fly it around in AH2...terrific fast commodity/cargo hauler. Oh, and i've never seen that pylon glitch on my version. Wonder what's up with that? Nice shots, The GAAR series of rally's are good fun, enjoy. btw- as my old golf instructor would say, "When you cheat in golf you are only cheating yourself." I fully intend to complete one of the GAAR's in a manner more befitting it's intent once I get a bird of its caliber into my Hanger. I know you don't really do X-Plane but do you have any suggestions apart from the standard DC-3 that most people seem to fly? I would fly the Baron58 or the C172 since they are in the default setup or even the Beechcraft Staggerwing which is an available addon I believe, all would give you time to look around and enjoy the scenery and get into those 4500' max runway lengths. They would also fall into GAAR's pre '75 aircraft theme. I always preferred to fly a single but you do have to check and make sure anything you pick will carry enough fuel for those times when an destination airport has no fuel and you have to fly a long distance between fillups. I do understand why most fly the DC-3, it's fast enough, carries lots of fuel and weight and you can fly it high or low and into almost anywhere. Well that and it was a default aircraft, fell within GAAR's old rules of anything aircraft made before 1950 and is fun to fly. Ok thanks @brettI might look at those when I do the NZ trip. I will say that even though its a very modern bird she poses her own challenges for these flights as she was designed to fly the entire route in one go rather than all of these little hops so I don't feel like I'm actually missing out on anything as I am very quickly learning about descent planning and shedding enough speed to land. Good set of pics. We don't see many of these on here.